I know. I know. I said that my last post would be the last flip before baby. But what can I say? She was apparently too comfortable to vacate the premises any earlier than she had to so I’ve been left to my own devices while she takes her sweet sweet time. Is this any indication of what she’ll be like on the outside? Heaven help us. 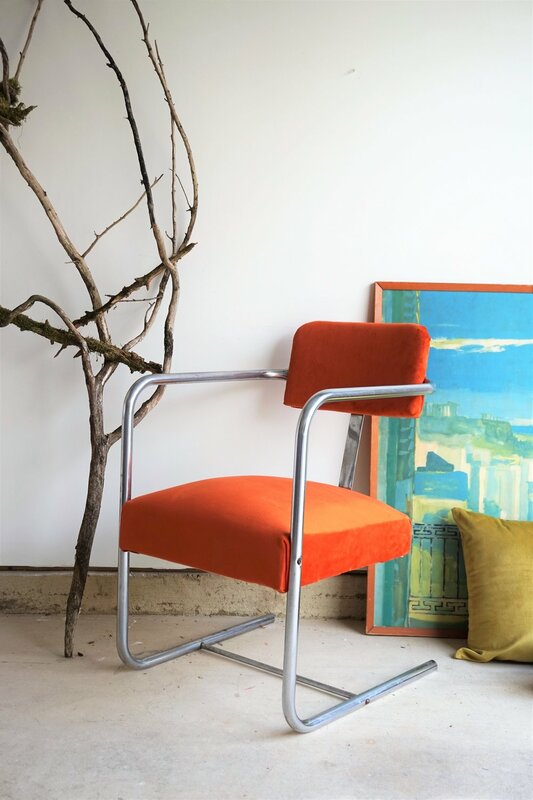 We all know I love me a good cantilever chair (see here and here). 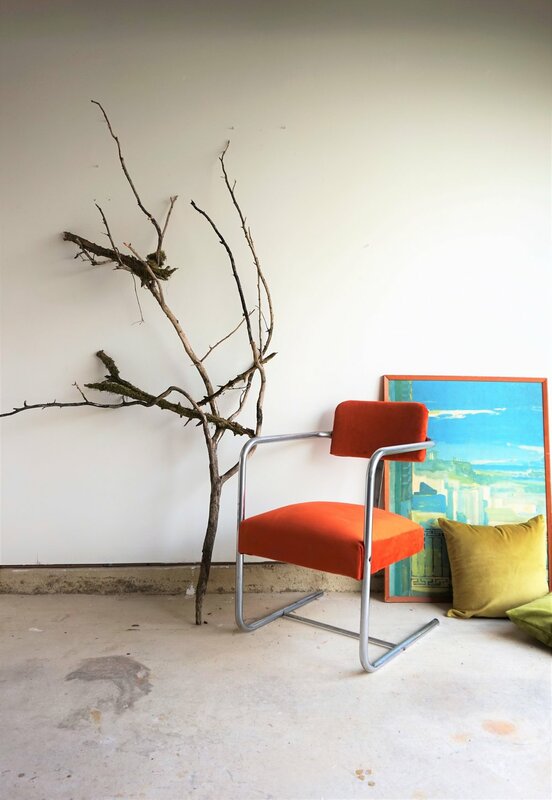 In fact, I’ve been hoarding a chrome cantilever chair in my workshop for a few months now so it was the perfect quick flip to crank out in my impatient 39-weeks state. We also know that I love me a good terra-cotta color but guys...if you put it in velvet then I’M JUST SMITTEN. As I said before, the chrome wasn’t in the most perfect but it was easy to shine up for the most part using some wadded up aluminum foil and water. That velvet - I mean COME ON!!! 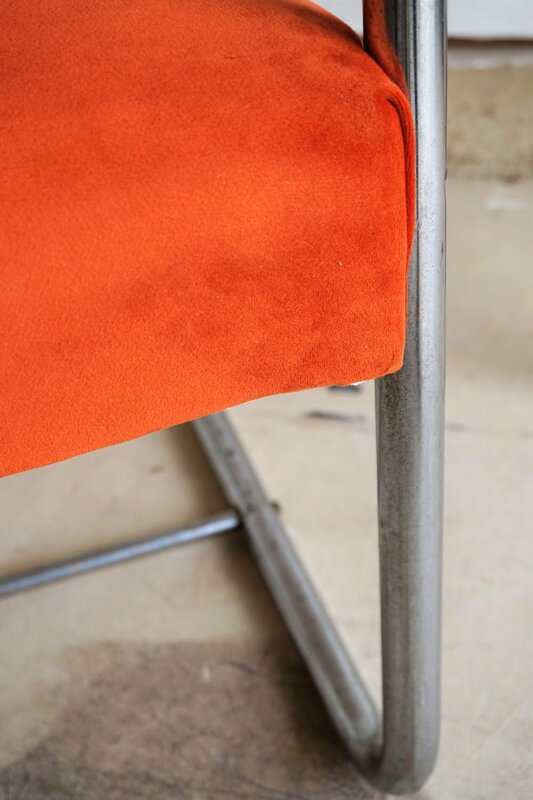 On the back of the chair, I added some matching chrome nailhead trim. And styled the whole shebang with stark shapes and vivid contrasting colors (also faves of mine): chartreuse and aqua. Ok that’s it I promise - I’m officially on maternity leave. 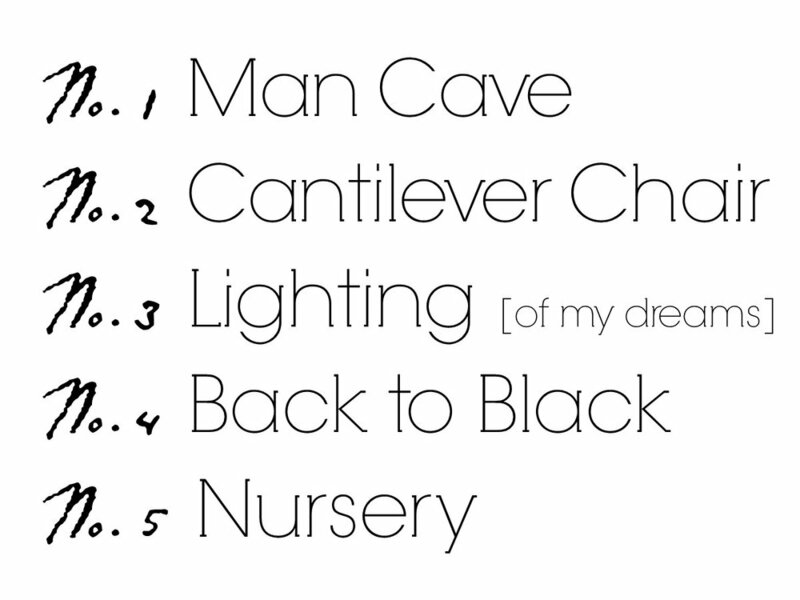 The good news is, with baby’s due date being today and all, this means I’ll at least have one more bucket list item to share in the near future - No.5: the Nursery! So stay tuned for that reveal and Baby H’s big debut! Two down, three to go. Catch up on the 2019 Furniture Flip Bucket List. Hi friends! Over two years ago we went on a little adventure when HGTV Magazine came to shoot our house, and the feature has just been published in their January/February issue! It was a surreal opportunity and one I still can’t believe happened to us in this house . It feels like yesterday I was refinishing thrifted pieces of furniture in our garage while my three babies took their afternoon nap. Now, Cate and I actually have a business growing on itself! You just never know where trying something new could take you; where that step of faith could end up. This has been our mentality from the beginning and continues to inspire us to bring out the best in this home as long as we are here. 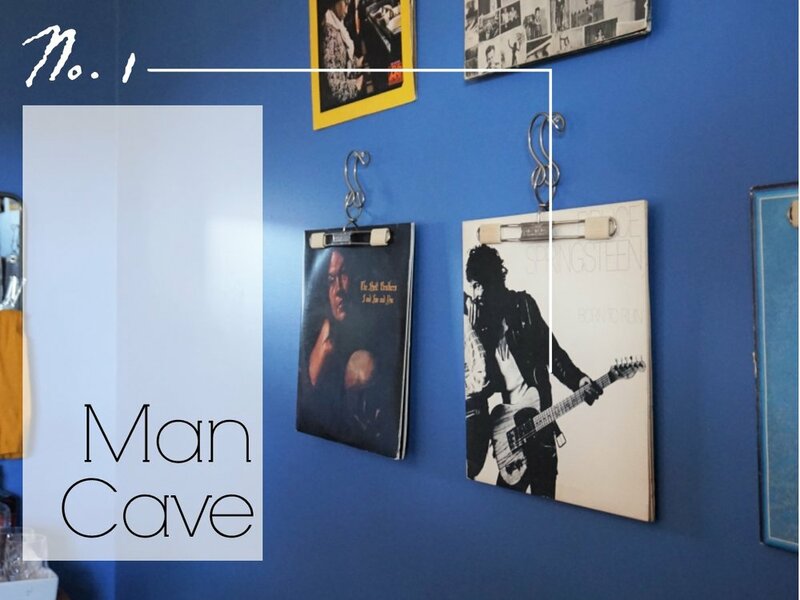 So without further adieu, I thought it would be fun to take a gander at the article together followed by how our home looks now! Kinda grainy but here we are! Matt’s looking exactly the same. Way to go, babe! First off, CATE rescued those leather chairs and updated them with legs, (you can see how here)! I loved them so much I bought them up quick when she posted them to sell. When we invested in our dream sofa, the two leathers didn’t quite go so well in the room together so I had to part ways, unfortunately. Quick story: During the process HGTV kept asking me my favorite colors to use in our home. In hindsight I think I should have given them more than just, “White and wood. And a little black.” Clearly they weren’t satisfied! I always bend earthy. Always. Even with our design clients. Maybe it’s because we live in the woods and I am constantly inspired by the changing seasons right outside our windows, but I have always enjoyed quieter earthy color palettes. 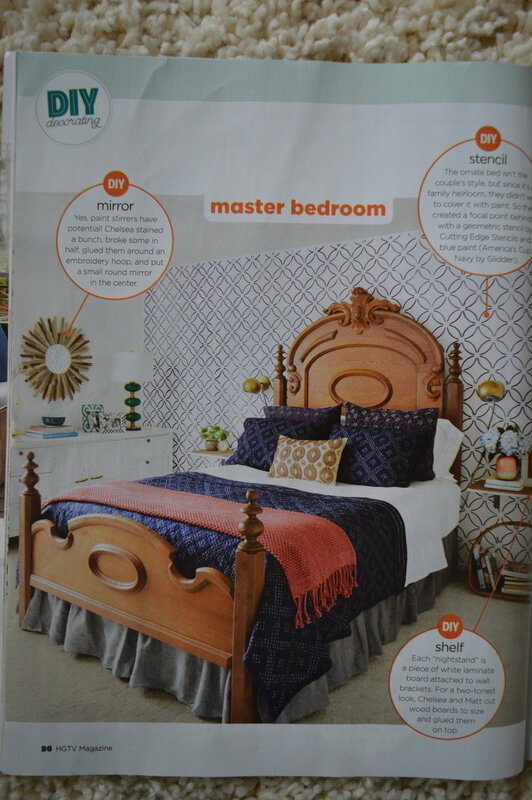 It was wild to see our house so ‘done up’ for a magazine! We did keep the mirror between the windows in here, and that wood coffee table, (a piece MATT thrifted and gave me for Christmas a while back), is currently in our family room downstairs! Our current coffee table shown above is an old army cot I found on Craigslist! I removed one set of end legs and replaced the canvas with the neutral cover, and turned it into the piece we have now! The woven chair is a piece I got for free at a thrift store by cashing in some customer loyalty points. Hah! This is a wild one because we took that wall down on the right during the kitchen renovation this past Summer! (And by ‘we’, I mean our amazing contractor, Matt Stein, who makes all the things). But you’ll recognize those pipe shelves which are now in our living room! Still one of our favorite DIY projects. In fact, when we disassembled them to relocate to the living room, we actually moved a few parts around to accommodate the small desk space that’s on the right end of the shelves now! We are also still enjoying our dining table, which, as the article points out, I did sand completely down on a whim! I love the bare naked wood and with kids who love to craft and draw on it, it’s a very well loved piece with scars and marks to prove it! Even though the floorplan of our home was a little different two years ago, my style was fairly similar back then with an appreciation for earthy tones and minimal layers, so it was crazy to see this space so full for the story! Yea, and we’re kind of hoping that neighbor doesn’t read this magazine! Hah! I always had a storage piece on this wall that was hiding our kitchen. Now that the wall is down the view is pretty different! We have absolutely loved opening this space up; it’s been a game changer in how we use our main floor now! The white cabinet here was something I sold during our kitchen renovation since we just didn’t need it anymore, but it remains one of my favorite refinished pieces! While our bedroom was never this busy, this is still surreal to me! That bed belonged to my great-great-grandparents! And stenciling that wall was one of my favorite projects I did in this house early on. I preferred white bedding to let the stencil shine and to give the bed a slightly modern nod, but this shot still makes me nostalgic. I passed the bed onto my cousin when she and her husband needed a bedroom set in their new home, and Matt and I filled our room as we do with Craigslist finds and new DIY projects. 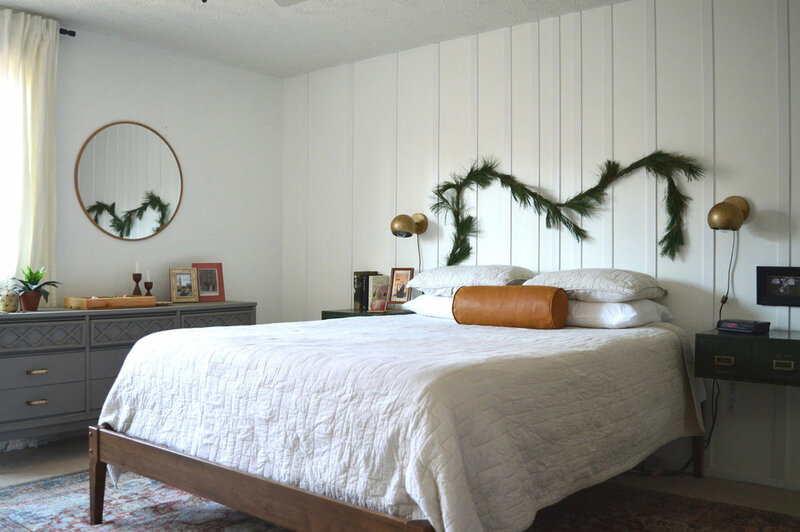 Our current bed was a CL score, my dresser was a thrift store piece that I refinished, the trimmed wall was our design and a project we did last year, and the dark green metal catalogue drawers are currently our floating bedside tables. I love that these two shots represent a lot of DIY projects, but done in really different styles! There truly is no limit to what DIY can look like. All in all, this was a HUGE learning experience for me and a first in every way. For one, I learned what HGTV magazine considers to photograph well for a printed editorial, and am curious to know if my true earthy, laid back style would ever photograph as well. I loved getting to know the team, (two photographers, one stylist, and two HGTV editors), and observing how they work together. Oh yea, I forgot I had these shots together! The second one is with photographer, David Tsay - I had actually been following and admiring his work before I knew he was assigned to shoot our home! The group shot includes his assistant, and the stylist behind the whole shoot, Charlotte Safavi - I don’t know how that woman sleeps! She is highly accredited and it was a pleasure to watch her work on our home. Everyone was incredibly kind to my family, playing with the kids and making us all feel like this was the most normal thing in the world! I truly cannot say enough about those people. 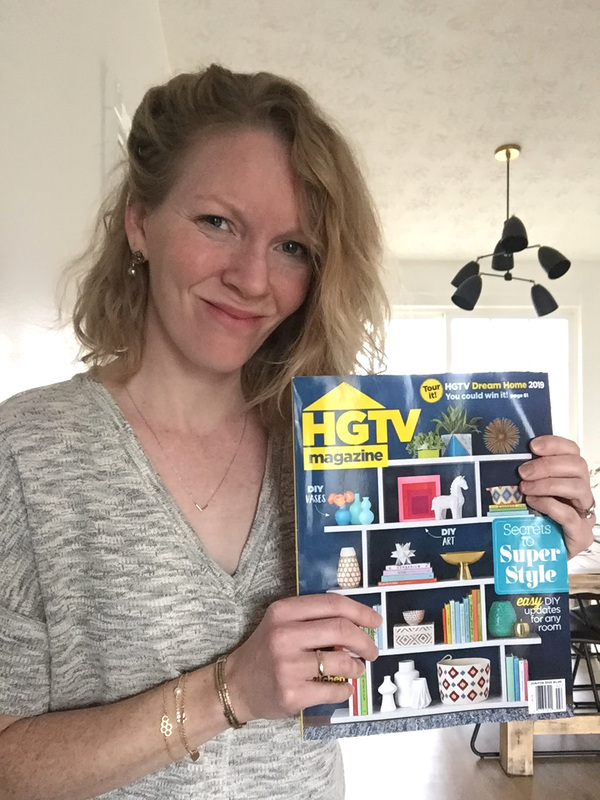 HGTV is running a mighty operation over there, and I realize that I’m about as valuable to them as the Hershey Kiss on the back cover of this issue! Regardless, I am so grateful to them for inviting us to grace a few of their pages. While our styles are quite different, I feel like our business missions to inspire and encourage others in their homes really reflect each other. Empowering others to bring out the best in their home, be it a room to call their own, a studio apartment, or a single family home, is something we are both passionate about. It was such an incredible opportunity to work together towards that mission. I often say, “You don’t know what you don’t know,” and with this experience that statement couldn’t be more true! But I enjoy taking risks. This whole thing started when I became a stay at home mom for the first time and thought, ‘well now what?’ There is so much adventure to uncover in our day-to-day lives, even as a SAHM in small town suburbia. This experience was nothing short of an adventure, for sure! If you would like to see more of our home and the work I do with our design clients, please find me on Instagram at chelsea_stylemutthome. 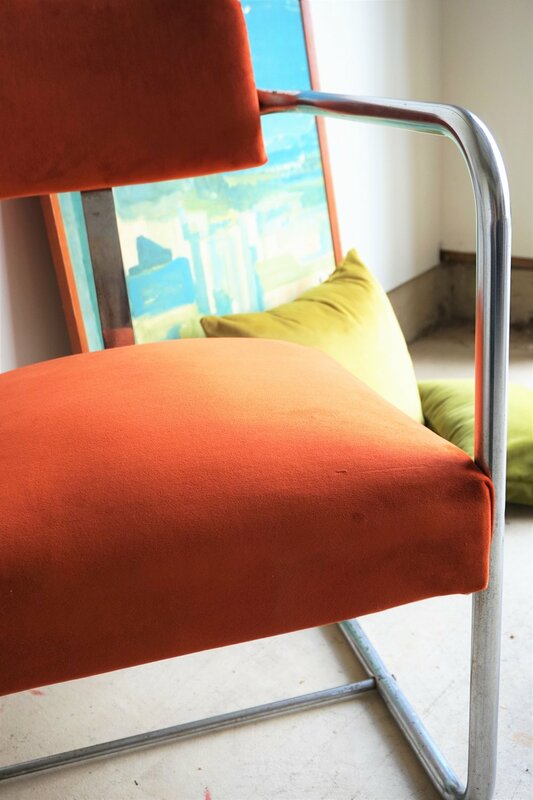 To follow more of Cate’s incredible refinished finds, you can check her out at cate_stylemutthome! Hi Friends! Over the years I’ve called my Christmas home decor ‘simple’, ‘minimalistic’, etc. I don’t like a lot of fuss - not over the holidays or in our every day life. But it got me thinking there’s got to be a way to simplify beyond the decor, too! Celebrating Christmas with little ones can get chaotic and out of control fast. I’ve had this pull on my heart to simplify not just our home, but the way we celebrate, too. Careful not to read that wrong - I don’t want to celebrate Christmas less, just simplify it. More emphasis on less things, if that makes sense. Gifts are a really fun way to celebrate that Jesus was born for what would be the greatest act of love in history, and I love the opportunity to give gifts as an expression of our joy and gratitude. But they don’t need to occupy so much mind and heart space as they have for me in recent years. It can get stressful fast! Experience - Matt and I rarely get one-on-one time with our kids, especially not him and I together with each kid, so we want to take each kid out on a date together. Ideas include a movie, ice skating, favorite museum, hike - we’ll give each kid an envelope on Christmas morning with an invitation for a date with Mom and Dad. I think I’m most excited about this one! Winter Pjs - I love finding fun pajamas that are relevant to each of their interests/personalities! Creativity - Our kids really, really love creating things. They are always in the middle of making something, and this has gone on literally for years. Things like construction paper, markers crayons, tape, and craft scissors always get used up fast! Christmas is a great opportunity to replenish their supply! Christmas shopping has been a lot less stressful so far, and a whole lot more enjoyable! Oh! And a huge part of preparing our hearts, (and home), for the season is cleaning out and donating old toys! Every November I ask the kids to commit an hour to going through their toys/books and bagging up what they have lost interest in. And when they’re on the fence about something I know they haven’t touched in a while, I try to redirect their focus to the kid that would have the opportunity to enjoy that item next. I don’t think it’s such a bad thing to practice making tough decisions about what to keep and what to part with. I’ve seen the show Hoarding: Buried Alive. LOL! 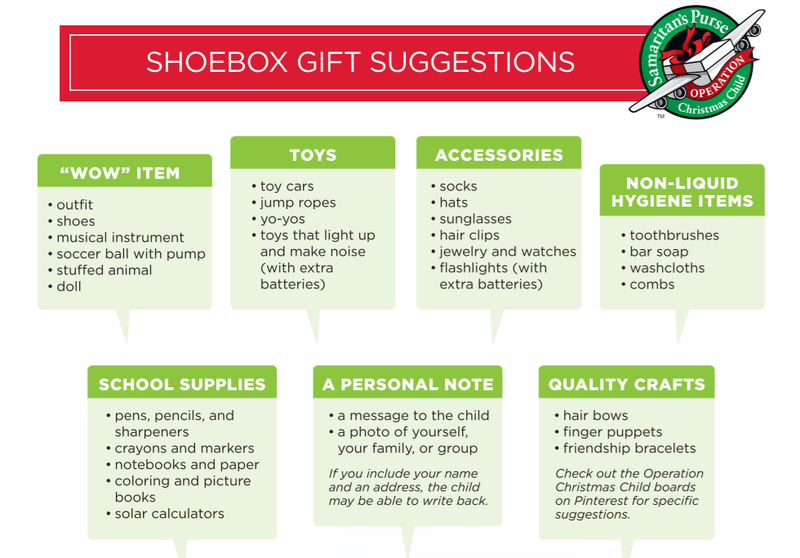 Maybe you already have your own gift-giving structure, or maybe this is helpful! We’re trying it for the first time this year and I’m already feeling a lot more peace about shopping for gifts than I have before. However you celebrate I hope you enjoy these next few weeks! There can be so much pressure on creating that perfect Christmas morning that this month between Thanksgiving and Christmas goes by in a blur. Give yourself permission to slow it down. No one but you will notice what you don’t get done, and that’s a truth I need to remind myself of often!